DALLAS, Texas (CNN) -- Police in Irving, Texas, captured a convicted burglar Wednesday who escaped from a medical facility last weekend by rappelling off the building using a string of bedsheets, a department spokeswoman said. Saturday night's escape was the third for Joshua Duane Barnes, 21, since June 2008. Joshua Duane Barnes, 21, escaped Saturday night from the Texas Department of Criminal Justice Hospital at Galveston. It was Barnes' third escape from authorities since June 2008. Each time, he was caught in four days. He will face felony escape charges, spokeswoman Michelle Lyons said. According to the Criminal Justice Department's inspector general, about 9:30 a.m. Wednesday, police received a call about a suspicious person in a park, Lyons said. The man ran as police approached him, and police chased him. The man, later identified as Barnes, barricaded himself in an abandoned residence before surrendering to police without incident about 10 a.m.
Barnes was to be taken to one of the department's Huntsville-area prisons later in the day. When authorities realized Barnes was missing Saturday, they noticed a hole in the wall where a vent had been removed. Barnes also had broken through a thick window. Barnes was serving 35 years in prison for felony convictions including seven burglary charges, two escape charges and an aggravated assault charge in the Texas Panhandle area, according to a department statement. He began serving his sentence in January. He was housed at a prison in Midway, Texas, but authorities said he was taken to the medical facility in Galveston last week after being hurt in a fight. Barnes' two other escapes took place in Potter County in the Texas Panhandle while he was under the control of local authorities. On June 6, 2008, he fled the county courthouse shortly after being asked to take the stand during a probation violation hearing. 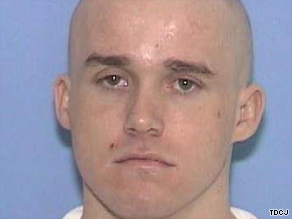 The second escape was on October 4, 2008, when Barnes fled the county jail recreational yard after hopping onto the corner of a roof and peeling back layers of sheet metal and galvanized fencing. In both cases, he was found four days later, hiding out at motels.